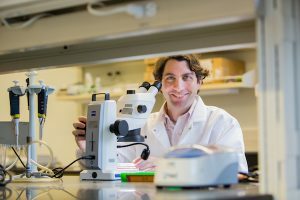 Dr. Benjamin Freedman, “Beno” for short, arrived at the Kidney Research Institute in 2015. He focuses his research on induced pluripotent stem cells and kidney regeneration. The Kidney Research Institute is fighting an epidemic of kidney disease. A public health issue. One in every seven adults in the United States has kidney disease—a 30 percent increase over the past decade. Prevalence rates around the world range between 10 and 13 percent. A public finance issue. Twenty-four percent of the U.S. Medicare budget is spent treating kidney disease; 7 percent is spent on dialysis treatment. Myriad complications. Chronic kidney disease is linked to premature cardiovascular disease, fractures, infections and diminished physical and mental functioning. Under the radar. Despite robust basic research, clinical practice has lagged in developing new treatments for kidney diseases, and in understanding uremic complications and other important questions with direct impact on patients.